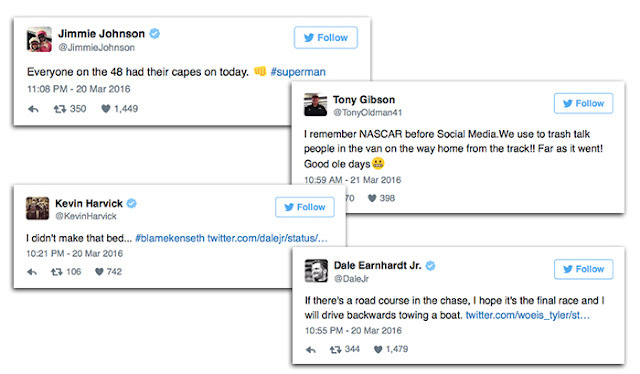 He had the "S" on his firesuit and on the hood of his car, but this past Sunday Jimmie Johnson truly solidified his place as NASCAR's Superman. 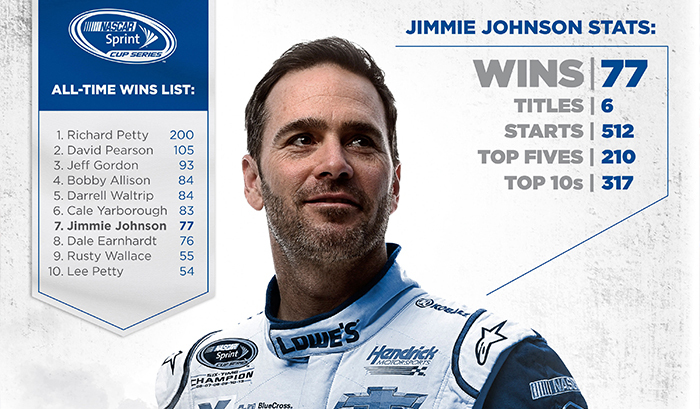 With his win in the Auto Club 400, Johnson moved past Dale Earnhardt Sr. on NASCAR's all-time wins list. "I feel like physically and mentally I'm the best that I've ever been in my career," he said. "So I'm in the space I want to be in, which tells me it makes me want to stick around and do this for a lot of years. There's no guarantees about when you're going to win and have success. I've been very, very fortunate to win 77 of these things, which blows my mind on its own." The 2016 season is young still, but it's been filled with high-drama and exciting racing. Already there have been two of the top eight closest finishes in NASCAR history, Jimmie Johnson continues his march up NASCAR's all-time wins list, four different winners in five races (including at least one from each manufacturer), the three previous Sprint Cup Champions (Kyle Busch, Kevin Harvick and Johnson) are all inside the top-5 of points standings and we're just getting started. The new low-downforce package is getting rave reviews on the track, as evidenced in Fontana where we saw green flag passes and multi-car battles for positioning throughout the field. "I think overall, when we look at the start of the season, we said we would kind of get through the West Coast swing and take a look at it," saidSteve O’Donnell, NASCAR's Executive Vice President and Chief Racing Development Officer. "But we still feel like … certainly it's going in the right direction. As NASCAR wraps up it's West Coast Swing and drivers head into their Easter weekend reprieve, driver and crew guys take to Twitter to react to what transpired in California. 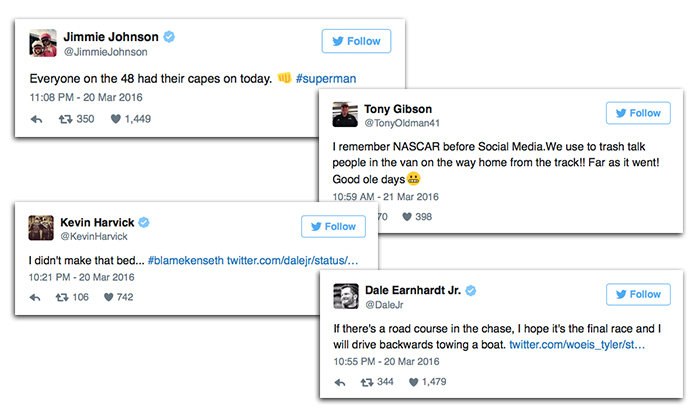 With a mix of haterade, bedhead, boat towing and more, here's some of our favorite tweets from the weekend as #NASCARgoeshome. We knew he could light it up on the track, but who knew Jeff Gordon could spit fire like that? Jeff's transition from behind the wheel to the broadcast booth has shown he's a natural in front of the camera. 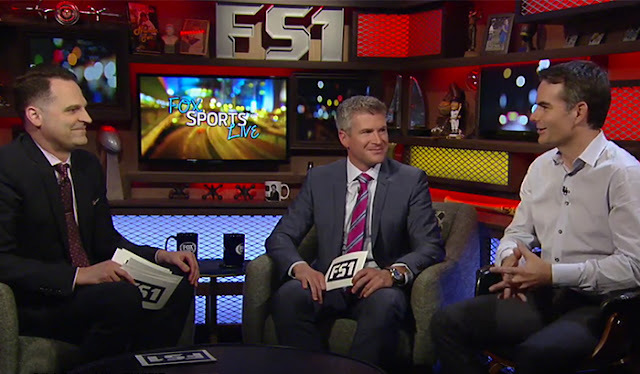 But Jeff showed the guys from Fox Sports Live he's got some chops behind the mic too, giving viewers a few lines Nelly himself would be proud of.